We are pleased to announce that after a few months of filming and collecting stories from Battersea residents, we are ready to screen our project to the public! 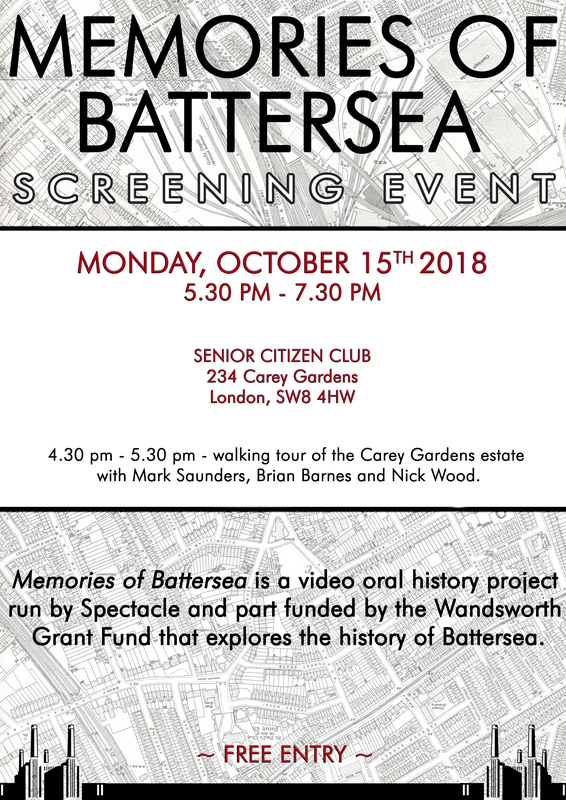 Memories of Battersea is a video oral history project run by Spectacle and part funded by the Wandsworth Grant Fund. The project gave young adults from Battersea the opportunity to be trained in film-making while producing short films about their neighbourhood, collecting memories from elder Battersea residents, bridging intergenerational gaps and engaging with the history of their borough. 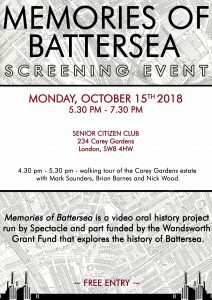 Memories of Battersea is an oral history video project run by Spectacle and part funded by the Wandsworth Grant Fund. The project gives young adults from Battersea the opportunity to be trained in film-making while producing short films about their neighbourhood, collecting memories from elder Battersea residents, bridging intergenerational gaps and engaging with the history of their borough. 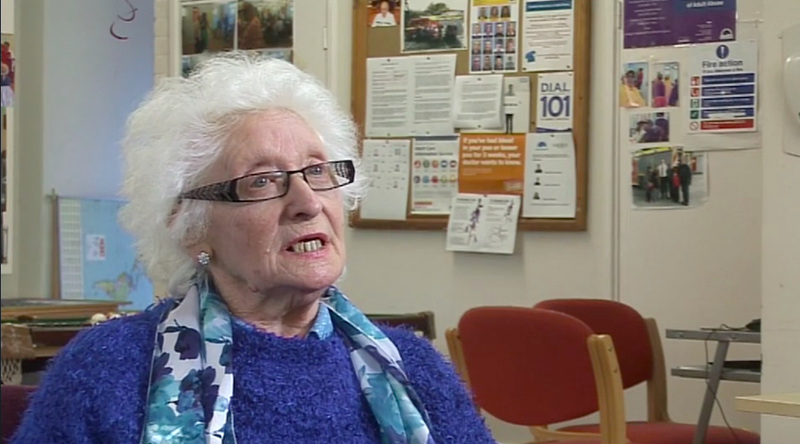 In Memories of Battersea we start with Jean, a Wandsworth born survivor of the Second World War. Jean recounts for us what life was like living through the German bombardment of V-1 flying bombs and V-2 rockets, her evacuation spent in Oxfordshire as a child, what has become of her first home in Savona Street as well how she feels about new development in the Battersea area. Jean grew up in Wandsworth Borough as a child during the Second World War. Losing family members and friends, Jean tells us about the bombardment on London by V-1 flying bombs. Although only a small child, such terrible times have remained with Jean for her entire life. After life became too dangerous for people in Battersea as a result of the bombing, she was evacuated to the village Grendon Underwood in Oxfordshire. There she was cared for by a couple in a large rectory with many others from London. Jean’s safety was short-lived however when upon her return to Battersea, the German V-2 rockets began, knocking a Church down nearby. Although Jean and her mother survived the war at home, the same could sadly not be said for her father whom was called up to fight. As many families celebrated in the streets of London, marking the end of WWII at by holding street parties called ‘Peace Teas’, Jean’s family alongside many others would never see their loved ones return from the field. Now living in Carey Gardens near The Patmore Estate, Jean has witnessed a dramatic change in the area. No longer Savona Street, Jean’s old home has become part of what is now known as Savona Estate. More worrying for Jean however, there are now plans to build a large number of flats on the estate, a building much taller than those surrounding it including Carey Gardens. Jean worries that these new flats may attract a different demographic of people, which wouldn’t suit the friendly nature of her beloved estate. This film was shot by participants on Spectacle’s 4 day training course.